256 pages | 25 Color Illus. | 175 B/W Illus. Image-Guided Radiation Therapy presents key image-guided radiation treatment (IGRT) technologies for external beam radiotherapy. The book explores the decades-long technological developments that have occurred in the realm of image-guided conformal, customized radiation treatment. Expert authors, all of whom have actively participated in the development or implementation of IGRT, imaging, and enabling technologies, share their first-hand experiences on the science, clinical uses, and impact of these technologies. They describe kilovoltage and megavoltage imaging as well as radiological, ultrasound, and optical technologies for determining and validating target and patient positioning. The book examines how anatomical and biological imaging using CT and PET has contributed to the understanding of target volume boundaries and biological behavior. It also explores such innovations as 4D PET/CT and digital tomosynthesis. Advancing patient care, this book focuses on a wealth of hybrid IGRT technologies and devices for coupled imaging and treatment inside the radiation treatment room. It thoroughly covers the modalities, software tools, and imaging treatment geometries that constitute IGRT. Image-Guided Radiation Therapy contains valuable information on the history of image-guided radiation treatment (IGRT), imaging systems, and secondary technologies. It is extensive in the explanation of how such systems are used clinically, and it covers most of the devices offered by manufacturers today. 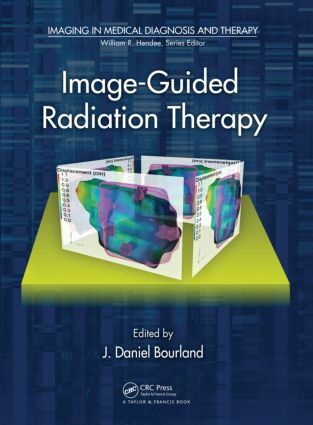 It is truly a remarkable compilation of focused and detailed chapters that span the art of image-guided radiation therapy. J. Daniel Bourland is a professor in the Department of Radiation Oncology at Wake Forest University School of Medicine. Dr. Bourland is a fellow of the American Association of Physicists in Medicine and a diplomate of the American Board of Radiology. He earned a Ph.D. in medical and health physics from the University of North Carolina at Chapel Hill. His research interests include imaging in radiation treatment, small field dose calculations, radiosurgery, bioeffects from radiological terrorism, and small animal irradiations.